How a dog's personality turns out depends on the environment he is raised in and whether or not he receives proper training to make him the best companion he can be. Without good early socialization, firm but fair boundaries and consistent expectations, even the best dog can develop behavioral problems that would make him unsuitable as a child's companion. General breed temperament as well as size, intelligence and reliability were all considered in the selections for this list. Fine-boned dogs that would otherwise make lovely companions were left off the list because they could easily be injured by even the most well-meaning child. Larger dogs known to have quite boisterous personalities were also left off the list because they could accidentally injure a smaller child without meaning to do so. Generally speaking, most small dogs do not make ideal companions for children because there's a risk that the animals could be accidentally hurt during play. While this is true to some extent, there are some small dogs that hold their own quite well with kids, and they seem more than happy to do so. Beagles - This breed is a perennial favorite with families, and this is largely due to these dogs' happy-go-lucky natures. They are quite smart, and their energy level is a good match for active children. Bichon Frises - Although the Bichon is on the small side, it is still rather sturdy for its size. 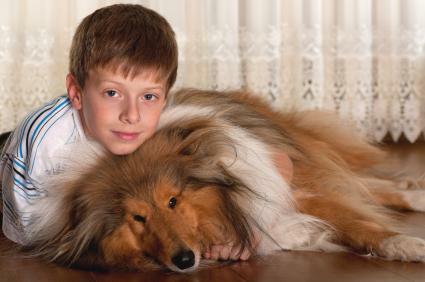 Younger children may need to taught how to be gentle with these dogs, but they make wonderful companions for older children. Happy and playful, Bichons can match the boundless energy of their young playmates. Miniature Schnauzers - This is the smallest variety of Schnauzer, and it is a terrific companion dog. It's sturdier than many other small dogs, loves a bit of adventure, and shows good common sense in most situations. Cairn Terrier - The Cairn is a great companion. These dogs love to go places and probably consider themselves one of the kids. They can be a little head-strong, but all they need is proper training to develop their manners. They are devoted to their families. Border Terriers - Border Terriers are known to be a bit calmer than many Terrier breeds, but they have enough energy and common sense to get along well with kids. 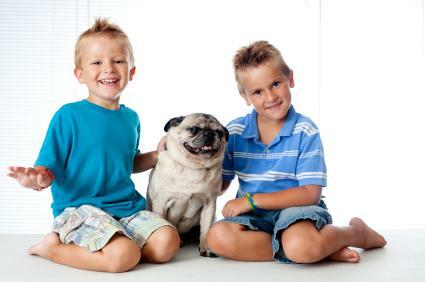 Chinese Pug - It's difficult to find a more happy-go-lucky companion for a child than a Pug. Pugs are built stronger than the average Toy dog, and they are quite resilient. While they don't have much guardian instinct, they do make lovable companions for kids. They easily keep up with the action, and they are nearly always ready for adventure and play. There's a good range of sizes to choose from when you're looking at medium-sized breeds. Miniature Poodles - It's no secret that Poodles are intelligent and highly trainable. While these are qualities found in all three varieties of Poodles, the Toy Poodle is a bit too delicate for small children. Miniatures are a bit sturdier, so they are a better choice for a child's playmate. Standard Schnauzers - Sturdily built and highly intelligent, this larger Schnauzer is also an excellent companion for children. They have a lot of energy, but this is balanced with good common sense. If you prefer a bit larger dog than the Miniature Schnauzer, the Standard is a good choice. Portuguese Water Dogs - These dogs also do well with children. They have a lively yet cooperative nature that's tempered by common sense. Shetland Sheepdog - Also known as the Sheltie, this dog displays high intelligence and a tendency to watch over his child companions. These dogs have a natural talent for the sport of agility, so they make awesome playmates for kids. 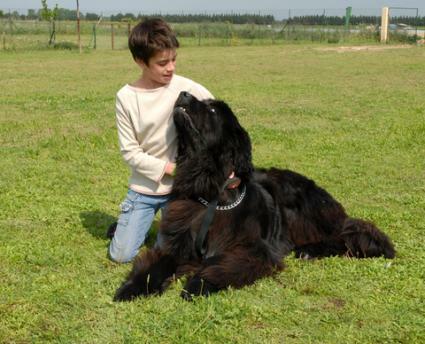 A number of large dogs can make suitable companions for children. Some require more coat care than others, so make sure you choose a breed that doesn't require more grooming than you can keep up with. Labrador Retrievers - Labs are naturally outgoing and athletic. Train them early as puppies, and they will make wonderful buddies for kids. Standard Poodles - Standards make good company for kids. They are sensible, and they love a lot of attention, so the kids won't easily tire them out. Golden Retriever - The Golden is another firmly established family dog that is good with children. These dogs are steady, loyal and affectionate, and they are always ready for a good romp at a moment's notice. 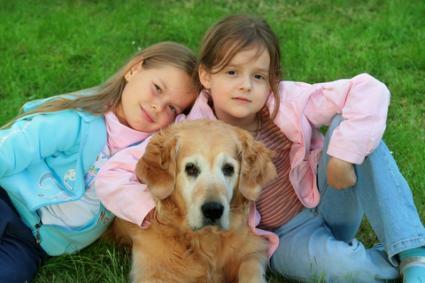 Goldens make playful yet dependable companions for children, and they get even better as they mature. Giant Schnauzers - The name is a bit misleading because these are not giant dogs; they are simply a larger version of the Standard Schnauzer. They are strong yet very reliable around children. Playful by nature, they are also easily trained. Old English Sheep Dog - Another natural shepherd, the Old English is also playful enough to keep any child entertained. This breed is prized for its steady disposition. A giant dog breed may not seem like an obvious choice for a family with children, but the situation can work out quite well if the dog receives training from early puppyhood. Newfoundland Dogs - Newfies are extremely gentle dogs, and they have a strong instinct to act as guardians over the children in their family. They are also incredibly gentle and calmly affectionate. Newfies aren't extremely high-energy pets, but they do have endurance in their favor. They have a very reliable nature and appear to have the ability to reason through almost any situation. Great Danes - Surprisingly calm for a large breed, Danes are very loyal to their families and known to be especially good with children. Don't let their size put you off; they have a reputation for being gentle giants. 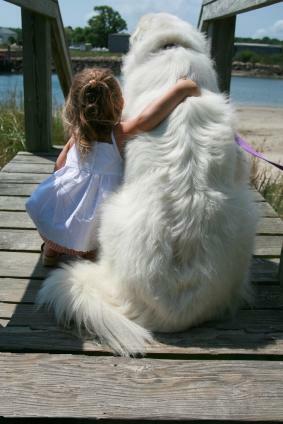 Great Pyrenees - Pyrenees are considered one of the giant breeds, but they can still be good family dogs. They are calm and watchful, and they have a natural instinct to guard children. They are also incredibly loyal to their family members. Make sure you acquire a Pyrenees as a pup so you can raise it around your children. Dogs that haven't been exposed to children early on have a more difficult time adjusting to them. If none of the breeds on this list appeals to you, the right dog may still be out there. There are hundreds of purebred dogs as well as mixed breeds that could make wonderful companions for children. The main criteria for choosing a particular dog are the same no matter which size dog you prefer. The dog needs to have a steady, calm and dependable temperament. He also needs to be very tolerant of his young companions. That doesn't mean such a dog won't make a good playmate; he'll simply show good judgment and be careful around the children no matter what's going on. Regardless of how big the dog is, he needs to be sturdily built. Children, especially young children, can be a little clumsy and may accidentally trip over the dog or step on him without meaning for it to happen. A heavier-boned dog is less likely to come to harm than a fine-boned toy dog. Although all of the breeds listed here make wonderful pets for children, that doesn't mean adults don't need to supervise the situation. All dogs benefit from obedience training to help make them the best companions they can be, and children need to be taught the right way to interact with their pets and take care of them. Deal with these issues, and your children just might have many years of wonderful times with their canine companion.